Pleomorphic adenoma is the most common benign tumor of the parotid gland. Surgical excision in the form of superficial parotidectomy or total conservative parotidectomy is the treatment of choice for this neoplasm. Pseudopodia are peculiar pathological characteristics of the pleomorphic adenoma, in which the neoplastic growth extends beyond the capsule in multiple fingers like projections all around. 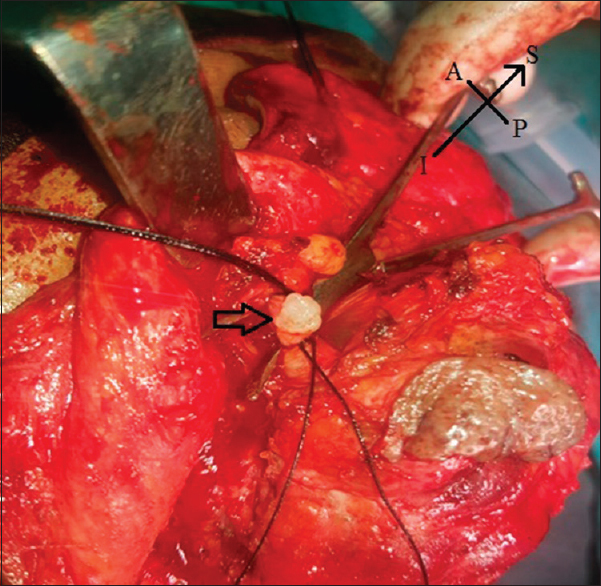 Here, we report a case of parotid pleomorphic adenoma which had the pseudopodia traveling through the Stensen's duct, without infiltrating its walls. Such an extension of pleomorphic adenoma into the parotid duct has not been reported in the literature till date. A 58-year-old male patient presented to us with insidious onset, painless swelling on the left side parotid region, slowly growing over the past 6 years. He had no difficulty in chewing, mouth opening, or in swallowing. He was a chronic smoker and had no comorbidities. He had undergone a surgery 3 years back for the same lesion, and the lesion was reported as pleomorphic adenoma. On examination, he had 8 cm × 8 cm swelling in the left parotid region, with a horizontal scar of two centimeters in front of the tragus. The swelling was nontender and firm to hard in consistency. The ipsilateral facial nerve function was normal and there was no palpable cervical lymphadenopathy. Magnetic resonance imaging of the face showed this lesion to be heterogeneous, having solid-cystic and multiseptated components involving both superficial and deep lobe of the left parotid gland. Fine needle aspiration cytology at our institute was also reported as pleomorphic adenoma. With detailed informed written consent, he was taken up for the total conservative parotidectomy under general anesthesia. Intraoperatively, the skin and subcutaneous tissue around the scar was unhealthy and had to be sacrificed. The lower divisions of facial nerve, i.e., marginal mandibular and cervical branches were involved by tumor and could not be separated. On cutting the parotid duct after ligating it, the tumor was seen in the lumen of the duct as shown in [Figure 1]. The whole of the tumor was removed in toto taking an adequate ductal margin. Postoperatively, the patient had an uneventful recovery with complete eye closure. 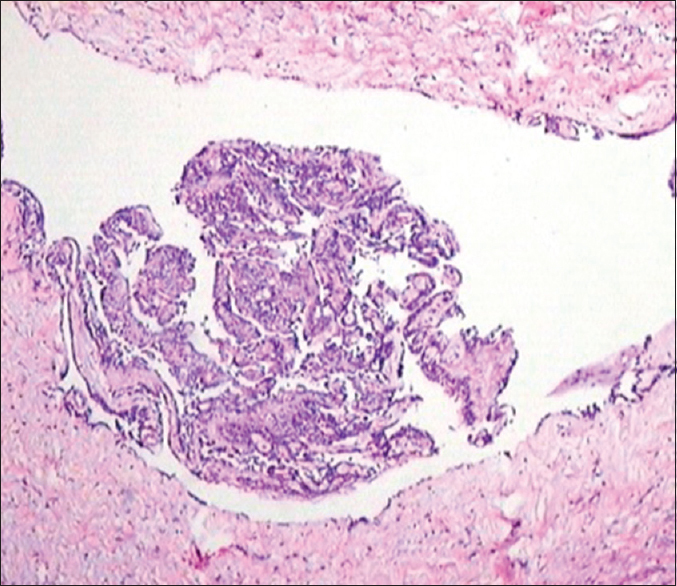 Histopathology revealed that the tumor was the acellular variant of pleomorphic adenoma. The tumor was extending into the duct but was not invading its wall as in [Figure 2]. The patient did not receive any adjuvant treatment and is currently disease free at 8 months' follow-up. Histopathological examination of the excised specimen, however, clarified that it was still a benign disease. Involvement of the skin, in this case, is probably due to scarring after the previous biopsy. Similarly, tumor engulfment of the branches of the facial nerve is also not pathognomonic of malignancy and could be seen in some benign tumors., However, the involvement of the parotid duct by a benign tumor has not been described earlier in the literature. This is the first time in authors' experience that a benign tumor-like pleomorphic adenoma is seen to extend to the parotid duct without invading its wall. The extension of tumor into the parotid duct without infiltrating the wall might be explained by the “pseudopodia-like extensions” commonly seen in pleomorphic adenoma. Failure to clear off these pseudopodia during resection of pleomorphic adenoma is hypothesized to be the cause of high recurrence rate after superficial or total conservative parotidectomy. Currently, around one centimeter of normal parotid tissue is resected all around the tumor to account for the pseudopodia. On the similar note, we suggest that the parotid duct must be explored after ligation, in all parotidectomies, to look for any tumor tissue inside the lumen. If tumor found, then the duct should be ligated further distally, and lumen should be examined until the lumen of the parotid duct is grossly tumor free. This maneuver would reduce the risk of recurrence at parotid duct area. This is important considering the morbidity and the difficulty involved during the revision surgery for such a recurrence. Spiro RH. Salivary neoplasms: Overview of a 35-year experience with 2,807 patients. Head Neck Surg 1986;8:177-84. Zbären P, Stauffer E. Pleomorphic adenoma of the parotid gland: Histopathologic analysis of the capsular characteristics of 218 tumors. Head Neck 2007;29:751-7. Flint PW, Haughey BH, Robbins KT, Thomas JR, Niparko JK, Lund VJ, et al. Cummings Otolaryngology – Head and Neck Surgery. 6th ed. Philadelphia: Elsevier Saunders; 2014. p. 1246. Liu CC, Jethwa AR, Khariwala SS, Johnson J, Shin JJ. Sensitivity, specificity, and posttest probability of parotid fine-needle aspiration: A Systematic review and meta-analysis. Otolaryngol Head Neck Surg 2016;154:9-23. Schmidt RL, Hall BJ, Wilson AR, Layfield LJ. A systematic review and meta-analysis of the diagnostic accuracy of fine-needle aspiration cytology for parotid gland lesions. Am J Clin Pathol 2011;136:45-59. O'Dwyer TP, Gullane PJ, Dardick I. A pseudo-malignant Warthin's tumor presenting with facial nerve paralysis. J Otolaryngol 1990;19:353–7. Nader ME, Bell D, Sturgis EM, Ginsberg LE, Gidley PW. Facial nerve paralysis due to a pleomorphic adenoma with the imaging characteristics of a facial nerve schwannoma. J Neurol Surg Rep 2014;75:e84-8. Kiciński K, Mikaszewski B, Stankiewicz C. Risk factors for recurrence of pleomorphic adenoma. Otolaryngol Pol 2016;70:1-7.